As enterprises embrace the cloud, there is an increasing demand for enterprise class connectivity, hybrid data center scenarios and increased network flexibility between various cloud networks, internal networks, etc. Microsoft has announced a number of features designed to improve the robustness, flexibility and security of your enterprise hybrid cloud networks. Through partnerships with AT&T, BT, Equinix, Level3, SingTel, TelecityGroup and Verizon (which more partners presumably rolling out in the future), ExpressRoute provides a dedicated pipe between these partner data centers and Azure instead of routing traffic through the Internet. This improves reliability, redundancy and overall bandwidth available for those hybrid scenarios which depend on moving a lot of data from your internal data center to Azure and back again. Note that ExpressRoute only works with IAAS – e.g. you cannot use it to connect to SQL Azure. 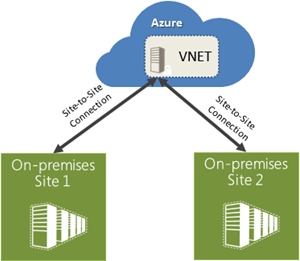 The Azure Virtual Network now supports more than one site to site VPN so that you could create an Azure Virtual Network and connect it to multiple on-premise locations. In addition, you can now link multiple virtual networks together in Azure. You can now reserve IP addresses and have them virtually allocated as static IP addresses. This is a key requirement for applications that don’t respond to swaps in IP addresses (SharePoint 2013 being a good example).